The democracy deserves respecting the mandate won by the public representatives. Still not any particular persons but independent institutions uphold any plural democracy, protecting lawful interests without any discriminations so the institutional sanctity is inviolable everywhere. The constitutional process must prevail over everything else protecting all that. The political inclusion is to become possible for everyone simply by joining the constitutional process. Everywhere this should become the norm. Sangkrit supports all the people insisting upon that. Personal relations paves the way of public entrapment to get people driven as per any vested interests of selfish people surrounding them. This doesn’t work to enhance people’s power but does diminish that. Failing as impersonal, power corrupts its core. Only oppressors benefit out of all that. One hundred years back the Bolshevik revolution was made by provoking the deprived majority ideologically to get rid of their elite, proclaiming that the prosperity in any society is built only by depriving the majority. Then they proceeded for demolishing that compulsion but ultimately failed by demolishing the prosperity itself. Truths get managed as the legends are supplied by the lies to make you believe anything. Sangkrit is making another kind of revolution that is quantum by nature. You need not to be impersonal like that for making this the movement as you personally outreach to your lot of people necessary for accomplishing this. You yourself lead this everywhere, becoming people’s personal outlet in a globally distributed order, by implementing your own prosperity diminishing other’s deprivation as well. You do so by running the program that actually works. 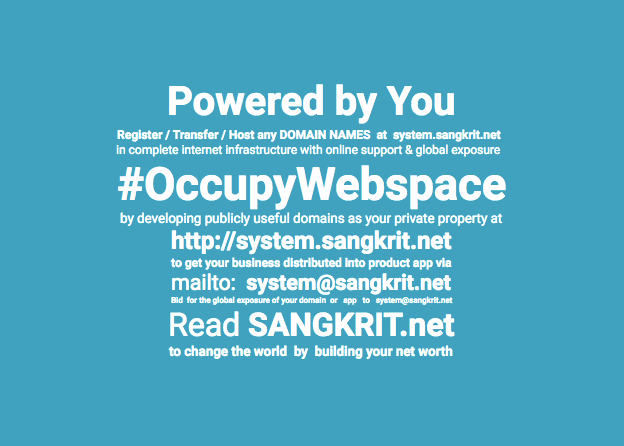 Read #OccupyWebspace on your android phone from Play Store. Making this the movement requires knowing that much. Power has been only impersonal but this time this is not so as personally developing a few personal outlets managing a few hundred domains is what actually makes you powerful. Internet has its own way of mandating for public utilities. Like facebook is mandated for social network while twitter is mandated for social interactions. Google is mandated for search upon world-wide-web while Wikipedia is mandated for human knowledge resource. Understanding your mandate is very important for knowing that what for you are mandated and what for not. Like google is not mandated for social networking and facebook is not mandated for e-mail restructuring. Your mandate is mostly determined by the user experience of the utilities you run online. 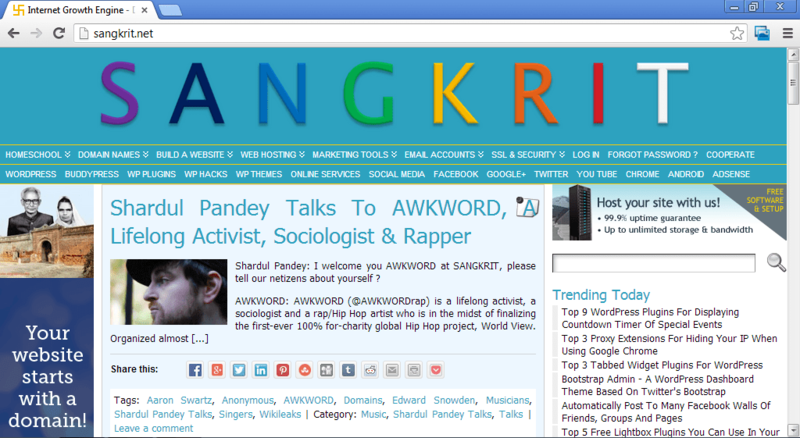 SANGKRIT.net is mandated as Internet Growth Engine for registering domains and hosting WordPress for promoting free press and business by accommodating AdSense. Consequently its title and tagline is considered as 100% accurate. Therefore it is the ultimate way henceforth that to save Internet we ought to expand it.